Once again, iTunes is hiding the great stuff. This time, the e-retailer has overlooked one of trombonist Earl Swope's best small-group recordings. 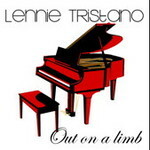 The iTunes download in question is entitled Lennie Tristano: Out On a Limb. All of the tracks feature pianist Tristano, of course, but seven have long been known in the Swope discography as The Lost Session. 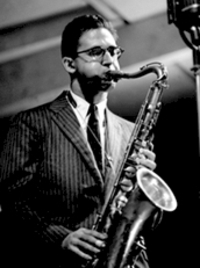 More on Swope (1922-1968) plus comments from saxophonist and band-mate Hal McKusick in a moment. The Lost Session date was recorded in the spring of 1945 and featured Lennie Tristano (piano), Marky Markowitz (trumpet), Earl Swope (trombone), Emmett Carls (tenor sax), Chubby Jackson (bass) and Don Lamond (drums). Tristano wrote the arrangements, and the 78-rpms from the date were labeled The Emmett Carls Sextet Featuring Lennie Tristano. Years later, when the sessions surfaced, the resulting LP was retitled The Earl Swope Sextet. Earl who, you say? Ask 10 jazz legends for the names of their favorite trombonists and Swope is sure to rank high on their lists. While the more familiar names of J.J. Johnson, Tommy Dorsey, Jack Teagarden, Vic Dickenson, Bob Brookmeyer, Curtis Fuller and Urbie Green are sure to be there, Swope's is the one most likely to draw a blank. 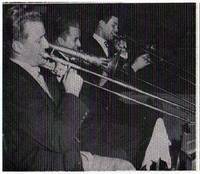 "Earl Swope would probably be the equivalent on trombone of what Al Cohn was on tenor." 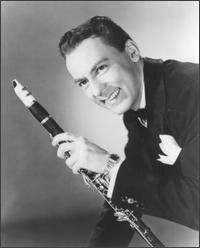 "I first met Earl on the [Boyd] Raeburn band, when we went into New York's Lincoln Hotel after [Count] Basie left. Later we were on the Buddy Rich band together. Earl was one of the so-called Washington, D.C., cats. They were all into Prez [Lester Young], and rightly so. They even tried to emulate him in every way, including his mannerisms. 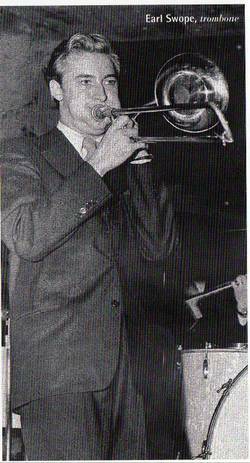 Earl was soft-spoken and had a strong approach to his trombone playing. He had a nice sound and was always swinging. He rarely spoke and never expressed much about anything. 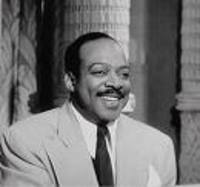 He was dedicated to jazz, and like me preferred the Basie [pictured] band over all others, although we had great respect for [Duke] Ellington's orchestra and other swing bands of the period. We all listened constantly to Basie, Prez and Billie—we couldn't get enough. Earl's solos were carefully crafted and presented with ease. 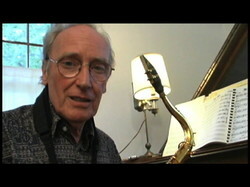 He was liked by members of the Raeburn and Rich bands, and we all enjoyed hearing him play. Earl's reading abilities were strong. I'll always remember his good musical taste and strong sense of time." "Earl Swope makes every number his home. Earl knows exactly where his solo is going; and after bursting into imaginative detours, he knocks it neatly into the side pocket. One of the trombone giants, Earl gives violent beauty to the ensemble sound of the section he leads." 1. Out On a Limb—Lennie Tristano. 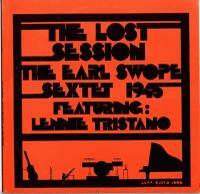 The first seven tracks of this download make up Earl Swope's The Lost Session. The two takes of These Foolish Things alone will give you a fine sense of how far ahead of its time Swope's trombone playing was. Remember, this is 1945. The rest of the tracks on the download are assorted Tristano dates from the same period, all of them excellent. You'll find it at iTunes. 2. Washington Concerts—Charlie Parker (1952-53). This album is available as a download, but for some reason a solid portion of the CD has been omitted at iTunes. 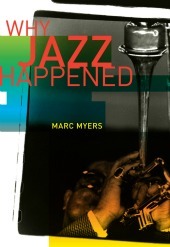 Fortunately, the complete recording is available as a download here at Amazon. Swope's best solo is on Now's the Time, all nine choruses of it! 3. Tiny's Blues (1948). 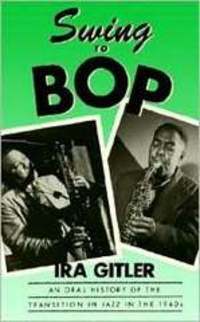 This up-tempo track kicked off the Bebop Concert held at the Music Hall in Washington, D.C. in May 1948. Earl takes a terrific extended solo here on this tune by Tiny Kahn. The other musicians on the stage included Ben Lary (tenor sax), Charlie Walp (trumpet), Mert Oliver (bass) and Sam Krupit (piano). 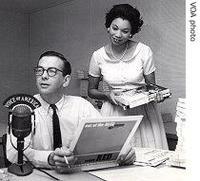 There's some debate about whether Earl or his brother, Rob, was playing on the balance of this date. You be the judge. 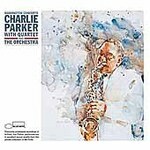 The concert can be found on the newly released Charlie Parker: Washington, D.C., 1948 (Uptown Records) here. 4. Pill Box—THE Orchestra (1953). 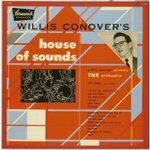 This superb track is from the Willis Conover's House of Sounds: Presents THE Orchestra album, which sadly is out of print and going for around $50 here. It features Bob Carey, Ed Leddy, Marky Markowitz and Charlie Walp (trumpets), Don Spiker, Earl Swope and Rob Swope (trombones), Jim Riley (alto sax), Ben Lary, Jim Parker and Angelo Tompros (tenor saxes), Jack Nimitz (baritone sax), Jack Holliday (piano), Mert Oliver (bass) and Joe Timer (drums). 5. 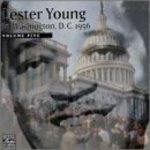 Lester Young in Washington, D.C., Vol. 5 (1956). 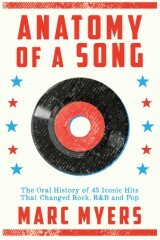 This one is available at Amazon as a download. It features Lester Young with Earl Swope and the Bill Potts Trio. Swope is featured on only the last four tracks: Lady Be Good, Up 'N' Adam, Jumpin' with Symphony Sid and Lullaby of Birdland. Hearing Swope with Prez, his jazz idol, offers a fascinating contrast between the silky smooth sound of Young and the the mellow trombone of Swope. It can be downloaded here. The thing about your blog is that it makes me instantly want to download all the music you write about. I had never heard of Earl Swope until 5 minutes ago. Now I need -- not just want -- to hear him. That's a great service to the music. Earl and Robert Swope were my uncles. I remember as a kid, them coming to our house and playing in the basement. Very exciting to know that they are both remembered. Earl also played in the Redskins band. To bad both of them passed away so young. Thanks. George.